THIS IS THE PERFECT UNIT FOR THE OFFICE OR LARGE FAMILY. 58 INCHES LONG 12.75 INCHES TALL AND 9 INCHES DEEP, DECORATED WITH 8 ANTIQUE ENGLISH HOOKS. 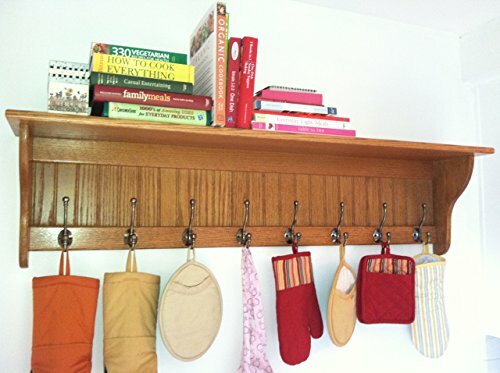 PERFECT FOR YOU TO PLACE GLOVES HATS OR WHAT EVER ON THE TOP SHELF AND DO THE HEAVY DUTY JOB OF HOLDING ALL THOSE COATS, PURSES, OR BACKPACKS!. PAINTED BLACK OR ANY MINWAX COLOR OF YOUR CHOICE. ITS SOLID RED OAK BUILT TO LAST AND PAST DOWN THROUGH GENERATIONS. CHECK OUT ALL OF OTHER GREAT ITEMS AND DESIGNS! Stain Colors - Natural, Golden Oak, Provincial, Red Oak, Puritan Pine, Ipswich Pine, Sedona Red, Colonial Maple, Special Walnut, Red Mahogany, Early American, Gunstock, Red Chestnut, English Chestnut, Cherry, Golden Pecan, Pickled Oak, Driftwood, Dark Walnut, Ebony, Weathered Oak, Classic Gray Please choose a color when you checkout and let us know Hooks in this style include: Antique Brass (shown) Satin Chrome Black Oil Rubbed Bronze If you would like to customize your item (size, material, hooks, and different color) please email us! THIS ITEM IS NOT MADE UNTIL ORDERED Build and Ship Time: Current build time is estimated at 2-4 weeks. We do try to have items shipped out within 15 business days but this time fluctuates depending on the current work load. We apologize for any inconvenience this may cause. If you need your item by a specific date please email us and let us know as we will do our very best to get it to you by the date. PLEASE NOTE: This item is built custom once it is ordered. The item you are purchasing is a handcrafted original. It may not appear exactly as shown. Additional time may be required depending on any custom changes you have made. Additional items shown in the picture are not included but some are available for sale, just send an email inquiring on an item and I can let you know. If you have any questions please feel free to email us. All of our items are one of a kind as each item is handcrafted individually here in our shop in Ohio.